I joined Bojac, George, and the guys from Nothing Sacred Tattoo on their Thursday night shop ride tonight. The ride is a smaller version of Bojac’s K.I.S.S ride, but sometimes just as fast. 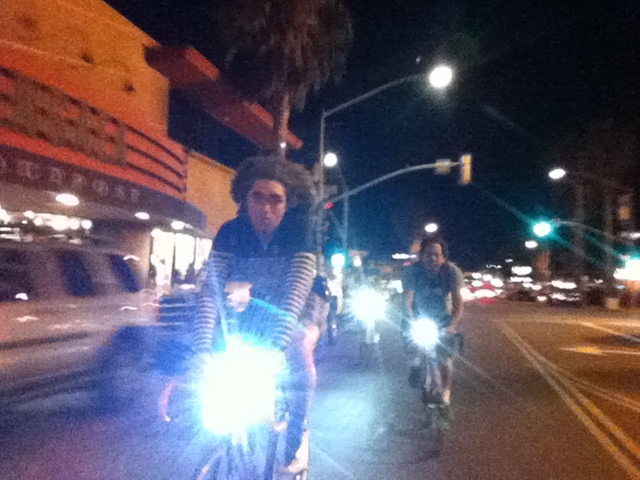 That’s Bojac in front, and me behind, riding up Garnet Ave in Pacific Beach. Thursday is a fun night for the ride, when people are out, and the weekend nightlife begins. I make sure I’m fueled up before I head out on these fast fixie group rides. There are a lot of little challenges and sprints, and you want that glycogen available when your legs need it. I ate some Shot Bloks for the sugar and caffeine before the ride for good measure. For day 22 of the 30 Day Bread Challenge, I ate 490g of pretzel buns. They’re made by the Sadie Rose Baking Company, and I got them from the grocery store. I ate two of the buns with butter, and used the other two for bison burgers with onions, tomato, and spinach & kale. I also picked up my usual order from Gabriel’s Tortilleria, and ate about 600g of corn tortillas today. I ate some with butter, and the rest with an avocado.